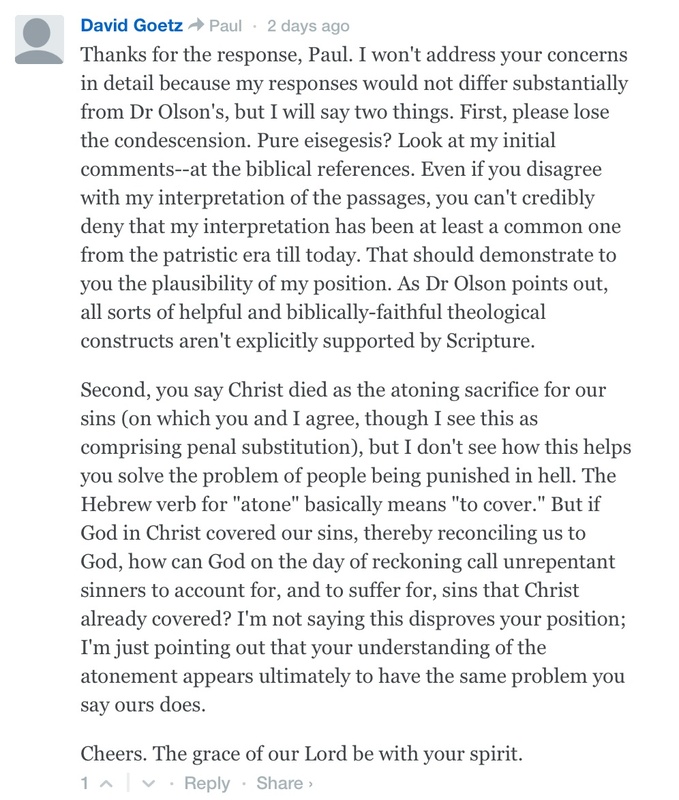 Nearly every week I read some Christian thinker criticizing penal substitution as a way (I believe it’s the primary way) of understanding the Atonement—how God uses the cross of his Son to save us. Not long ago, for example, I overheard two Christians arguing over whether the cross represented the expiation of sins or a propitiation for sins. To me, the argument was misguided. The cross is both. By all means, Christ expiated sins on the cross, but that doesn’t go very far. How does the cross expiate sin? Someone tell me how! To say the cross is “expiation” begs the question. The avoidance of the how question is common in the mainline Protestant circles in which I often run. Mainline Protestant preachers often say that the cross was a victory over sin and evil (liberals rarely mention the devil). Yes, but how is that victory won? 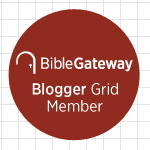 Penal substitution at least offers an explanation—one that is both in keeping with scripture and one that is objective. And speaking of objective, spare me Abelard’s Moral Influence theory, which remains very popular among my mainline Protestant colleagues. Of course the cross is the most powerful demonstration of God’s love. Yes, it’s very moving. But my subjective response to the cross can’t save me from my sins! Don’t get me wrong: I believe that the whole Incarnation saves us in the sense that Christ, as humanity’s representative, lived the sinless life of perfect obedience to the Father that we were unable to live for ourselves. His life substitutes for our life, just as his death substitutes for our death. But the problem with this so-called Eastern view is that it disregards too much of the Bible. As others have said many times, the Gospels themselves are passion narratives with lengthy prologues. 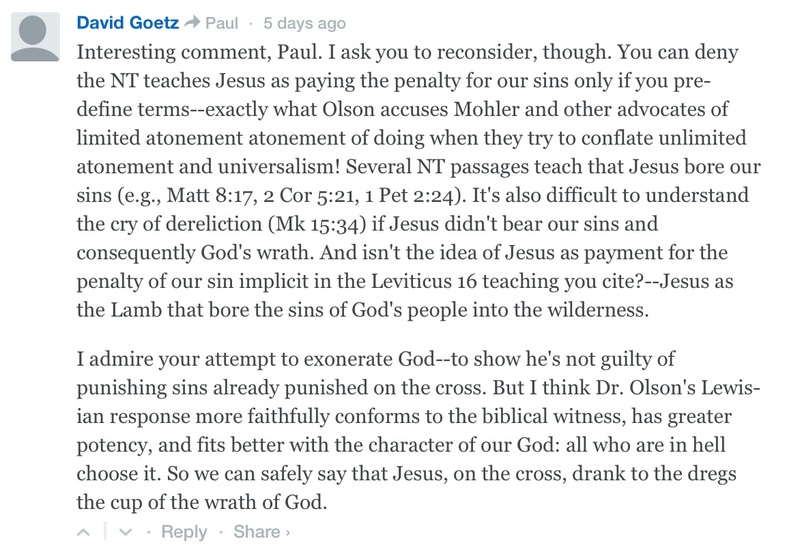 Clearly, the New Testament writers think that what happens on the cross is, well… crucial. 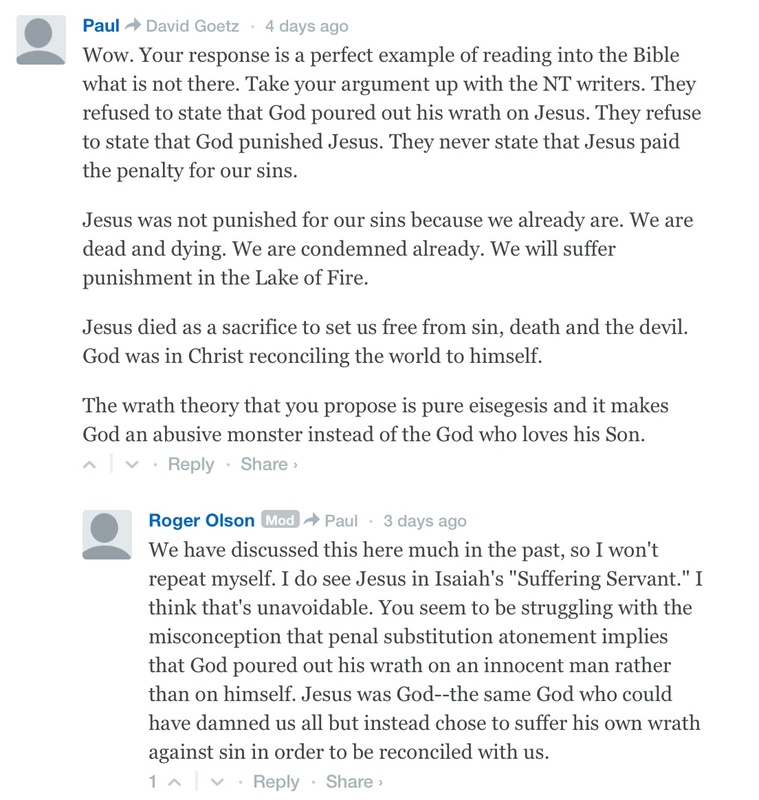 One thing that bother me is that BOTH sides of this debate seem to be missing something integral to at least SOME versions of penal substitution (e.g., Barth’s and Moltmann’s): Men committed the violence against Jesus, not God the Father, and the actual suffering of the atonement was the rejection Jesus suffered by the Father. “My God, my God, why have you forsaken me?” was the moment of atonement. God did not kill Jesus (at least in my version of penal substitution); people did. The Father did not inflict punishment on the unwilling, innocent Son as his victim; the Son volunteered to suffer the Father’s wrath. The Father’s wrath was not physical violence; it was the rupture within the Godhead suffered by both the Son and the Father (in different ways). The atonement was that he (Jesus), who knew no sin, became sin for us…., with the result that the Father had to turn away and forsake him. The penalty for sin is spiritual death; separation from God, not physical death. Thus, God practiced no violence in the cross; God did not “kill Jesus” physically. The men who crucified him did that. God used the opportunity (perhaps provoked by Jesus himself by his triumphal entry) to carry out his great plan to suffer the penalty for sin by making HIMSELF the sacrificial lamb let to the slaughter by sinful men–the scapegoat sent out of the camp bearing the sins of the world. But his being sent out, away from the Father, in shame, was ultimately his own plan (together with the Father and the Holy Spirit) and his choice. Weaver’s (and others’) complaint against penal substitution is not that it involves violence; it is that it makes God violent thus justifying our violence. Weaver knows very well the cross was violent, but he wants to make clear the violence was committed not by God but by Satan and sinful people. I agree. And that’s what I grew up hearing. 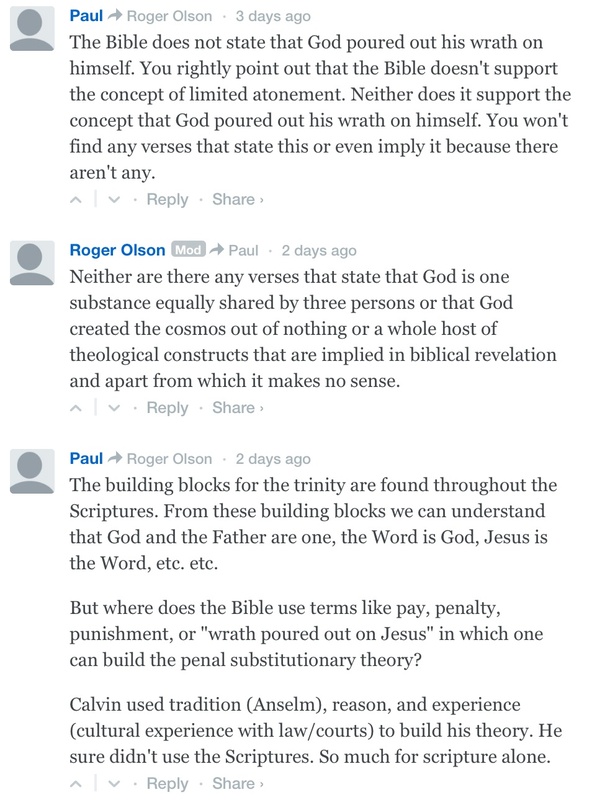 That’s how I’ve always understood penal substitution. The wrath of God poured out on Jesus was not the physical pain and suffering and death; it was God’s turning his back (metaphorically speaking)–abandoning Jesus to the hands of sinful executioners AS IF HE WERE TRULY A SINNER. In my own mind’s eye, imaginatively, I have always pictured things this way: In heaven, before the incarnation and cross, the Son sits down with the Father and Holy Spirit to talk about what to do about humanity’s sinfulness and deserving of hell (separation from God). They all know it and one of them says “There’s only one solution–one of us has to go down there and become the sacrifice for sins by being innocently condemned and killed by sinful people and Satan (shudder!) and being abandoned by the others of us. One of us has to experience being shunned as wicked by the others. Why? To satisfy cosmic justice which is rooted in our own nature. We warned them–that if they sinned they would die. Unless one of us dies in their place, they all have to die spiritually by being eternally rejected by us because of their rejection of us.” All three hands go up! “I’ll do it.” Because they love us. Love wins. But only one can do it. For reasons mysterious to us (but explored and partially explained by Karl Rahner) ONLY the Son can really do this. He gladly volunteers and goes away “into the far country” (Barth) to suffer human violence and spiritual death on our behalf. For more on this topic, see this recent blog post of mine. This entry was posted on	May 13, 2014 at 10:09 am	and is filed under Uncategorized. “Cursed is everyone who hangs on a tree.” This to me is a showing that Jesus was “cursed” when he died. And don’t forget the Suffering Servant of Isaiah 53!